Blogging Tips | How to start a beauty blog ? When you familiar with blogging, everything will come naturally to you. Ideas on posting, improve on blog design and connecting with other bloggers. But at the beginning, we all faced the same problem like posting ideas, connecting with other bloggers, designing and few people reading your blog. In the beginning, you face a brand new blogging experience where no-one in the blogging world, where you most probably feel confusing and don't know how to move from there. However, if you have two minds to do a beauty blog, my piece of advice is just go for it. Just start this blogging as a hobby then you will obtain skills and knowledge about blogging that can even lead you to a whole new experience and even better you get a career opportunity. You don't need a big make up collection or a top spec camera and high tech lightning or even to look like a fashion model to start a beauty blog. All you need is passion and love for writing and little bit of determination. The fear I have when I start blogging is that people will leave horrible comments. But, don't worry blogging is way better than youtube where people usually leave mean comments. In blogging, people usually support each other !! Once you decided to start a beauty blog, you need to consider on certain things. First, you need to choose a day where you have a couple of hours to spend on your blog. Try to mess around opening a few different social medias just to connect with people and promoting about your blog. Try to write something useful most of the time. Try to write something that people would interested to read or something that people wanted to know. For an example, if you want to google on 'How to start a beauty blog?' 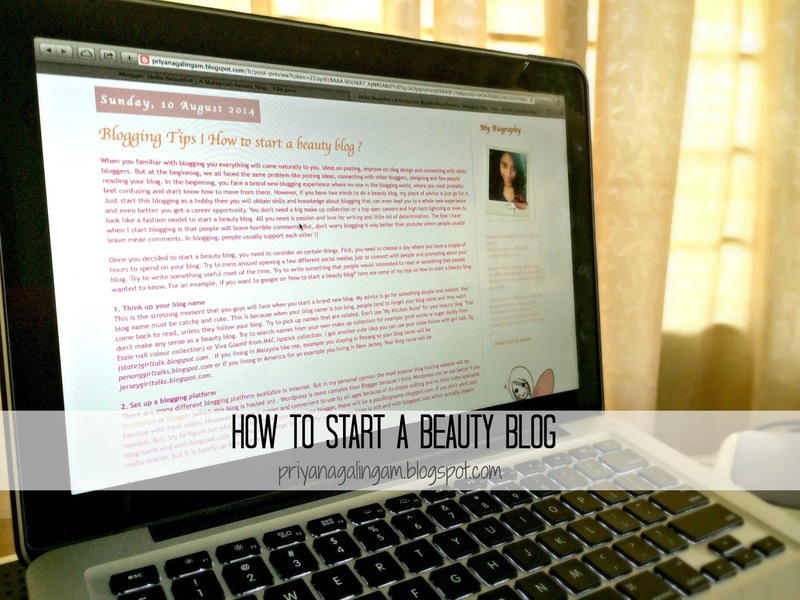 here are some of my tips on how to start a beauty blog. This is the stressing moment that you guys will face when you start a brand new blog. My advice is go for something simple and related. Your blog name must be catchy and cute. This is because when your blog name is too long, people tend to forget your blog name and they won't come back to read, unless they follow your blog. Try to pick up names that are related. Don't use "My Kitchen Rules" for your beauty blog. That don't make any sense as a beauty blog. Try to search names from your own make up collection for example (pink works or sugar daddy from Essie nail colour collection) or Viva GlamV from MAC lipstick collection. I got another cute idea you can use your state follow with girl talk. Eg. (state)girltalk.blogspot.com. 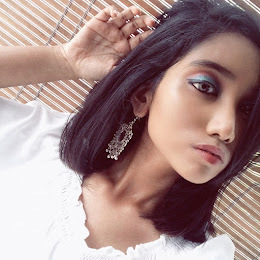 If you living in Malaysia like me, example you staying in Penang so your blog name will be penanggirltalks.blogspot.com or if you living in America for an example you living in New Jersey. Your blog name will be jerseygirltalks.blogspot.com. There are many different blogging platform available in internet. But in my personal opinion the most popular blog hosting website will be Wordpress or Blogger (which this blog is hosted on) . Wordpress is more complex than Blogger because I think Wordpress can be use better if you familiar with html codes. However, Blogger is easier and convenient to use by all ages because of its simple editing and no html codes specialist needed. But, try to figure out which one is best for you. If you use blogger, there will be a yourblogname.blogspot.com. If you don't want your blog name end with blogspot.com then you can change but even the most popular blogs is still end with blogspot.com which actually doesn't really matter, but it is totally up to you guys. By doing this, your readers will follow up with your and connect with more than just the blog. If you wondering how I put the social media button in my blog, I will post the post about that in the separate post very soon. Please stay tune. This GFC widgets is a little followers or join this site panel on your right side bar. When follow someone's blog, you will able to their post on your dashboard once you log in into your blogger. After some confusion on GFC, Bloglovin' became very popular among bloggers. This site allow bloggers to read and manage their blog subscription. It very important to include a bloglovin' button in your blog, so people can follow your blog. You can simply can sign up to Bloglovin.com. and you can add bloglovin button here to your blog page. Google plus become more interlink with Blogger lately, it is very important you to fill up all your particulars in your google plus profile. Try to avoid fill up too personal fills like mobile number and address. Try to fill up your blog information. Go to Google+ now and fill up details and add your blogger link/ Bloglovin' link and twitter link under the 'other profile' and 'contributor to' and your blog's email address if you have one. You can see how I feel up my Google+ profile here. If you already have a Bloglovin' account they will ask you to publish a post on a code given to claim your blog. If you done with that, you can delete that post and start from the beginning. You either can write introduction like about yourself or just jump to the post related to your blog. Some ideas that you can start with - products review, what you like/ dislike, favourites of the month (post on every end or beginning of every month), top five products for summer, top five products for back to school, FOTD/NOTD/OOTD (face of the day, nail of the day, or outfit of the day) where you can post about make up, nail colours and fashion on what you wearing. Try to write original and capture the picture original rather than take most of the pictures from photobucket or google or photo shock. I personally think that many beginners afraid of trying 'XL' picture size. I think you guys should try and make your picture look as bigger as possible for more readers to be attracted to your post. If you started your blog, let me know that this tips are helpful for you !! Great post and good tips.